Can Death really be seen on the hand? The answer to this question is that yes it can - but not with a hundred percent accuracy. I have already written about the fact that that no event in the future can be determined with certainty, and this applies to Death as well. But this does not mean that Death cannot be seen on the hand. Prediction of any sort is not a black and white thing. Just because future events cannot be predicted with certainty, it does not take away from the importance of hand reading. Hand reading is to be used as a diagnostic tool because we have dynamic futures. an inevitable event, but an event which can possibly be prevented or at least postponed in some cases. The clues are there to see, if they are read correctly. So, what are these signs that show the hint of death? What must be said first and foremost is that the end of the Lifeline does not show death. A person can live long past the end of the Lifeline and conversely die at a young age even though the Lifeline goes right till the end. What shows that death lurks nearby? Famous hand readers/palmists like Noel Jaquin have mentioned it. The quality of the ridges of the hand is a primary indication of life threatening disease. The ridges of the hand start to fray, weaken and at times disappear altogether, at the start on sections of the hand. I have seen this on the hands of terminal cancer patients. Hands which indicate fatal accidents of healthy people will not show these warning signs. A fatal accident or sudden death is difficult to diagnose with certainty as the fear and anxiety or some kind of intuitive feeling which has created certain alarming signs (which can indicate future calamities) may not result in what is foretold, if proper precautions are taken. People will persist in wanting to know – what are the signs that show accidents? Deep and dark bars, crosses or dark dots or stars on the hand, more so on the Lifeline, Mercury line, or Headline are to be noted as danger points, but usually only if they are as deep or deeper than the line itself. These signs usually jump out at you from the hand, so remarkable do they seem because of their colour and strength. The signs can disappear and the event may never take place. It is also difficult to decide whether these signs are an indication of physical or mental trauma (in one case it was the case of a head tumor which was finally cured and the person is living a normal life today), and that is why it is best not to try and explain what they mean. This is because no one can know for sure. No hand reader can ever be sure, not until after the event. And even if such a sign is seen to have been confirmed as accurate (after the event) it does not mean that a similar sign on another hand will mean the same thing. The same principle applies when it comes to predicting death. This post on Kishore Kumar's hand shows that his death was marked on the Fateline, and this is very unusual. The best practice for a hand reader is not mention death at all. The reasons are obvious. Not just because the hand reader can make an error, and not just because no hand reader can ever know for sure, but also because it can be traumatic for the person whose hand is being read. It can precipitate the event in some cases (due to anxiety or a fatalistic attitude). Respect Death. It is not predetermined, and it can be held at bay, but it can also strike when least expected, so do not make the error of disrespecting it by predicting it. The best way to see the Marks of Death on the hand is after the person is deceased. 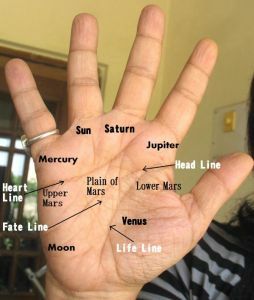 You might also like: Your hand lines are a reflection of you not vice versa or Stars, Crosses, Symbols and Superstition in hand reading or Can Palmistry predict future events? Or check out all the posts on Palmistry. I know what you mean. 100 seems very long, and there is a fear of being frail and not being able to get about. And senile! Yep, thats scary alright! What do mean by ridges. The two-three lines at the beginning of the palm? Ridges are not lines. They are the patterns on the skin. For example, fingerprints are formed by the ridges. When I was 23 years old, one of my best friend read my palm and said many things. One among them is that I would die before the age of 45. Now I'm 42 yrs, and everything he said about me came true except for my death. Will it also come true? I'm very stressed. Can anyone answer me? It is very sad that your best friend predicted your death but you can forgive him because he was very young and knew not what he was doing. It is not possible to predict death. If the other things came true, it was probably good guesswork, which was used with some half knowledge of palmistry, and the other half was knowing you very well. If you like, you can send me your hand and I will try and see what made him believe he was predicting your death and I will not charge you for this. Whether you send your hand to me or not, please be reassured in your mind that whether you die at 45 or 85, it will not be written on your hand. I'm afraid. I have a dot in the middle of my life line. Does this mean I will die? I really cannot say anything more than I have already said in this post. My fate line suddenly stops at my head line and my husband has two clear marriage lines. Both my children have a fate line that starts from their life line and moves toward the mercury mount. I cannot sleep due to reading that this predicts death. Please help. The fateline stopping at the headline does not mean death. Death cannot be predicted from the hand. Two marriage lines do not mean two marriages. I suggest you read my post on marriage lines. And any line which goes towards the mercury mount is not a fateline but a mercury line.